A hot mess, cleaning up the studio !!! 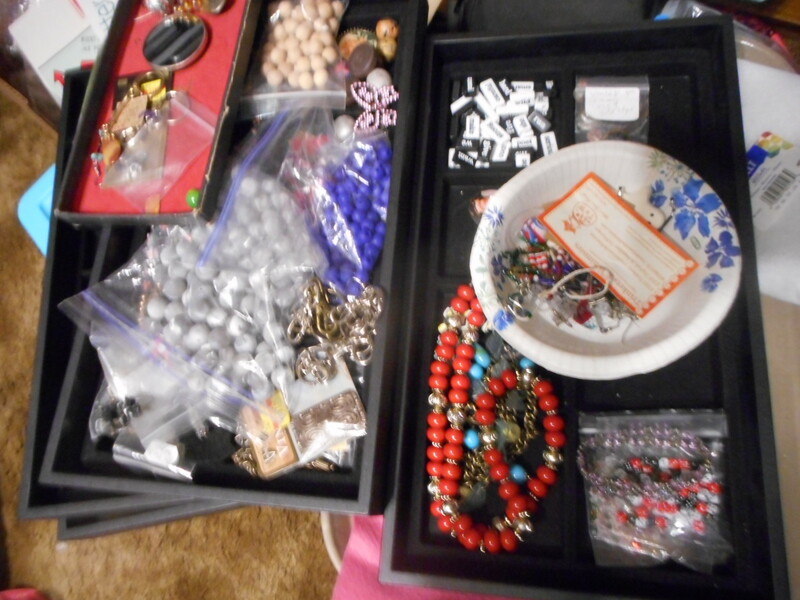 I am in the process of putting away and organizing all my beading supplies that were on trays from projects. Despite telling myself every single time, I will never do it again, I end up filling trays up with beads and findings when I was making up a lot of items for the store cabinet, and also when I did some stuff to try to get in a boutique, but it did not work out, she needed to buy my items much cheaper than I could let them go. I would have barely broken even. So, I am working on putting away, every single bead, and finding I have. Most of my jewelry, except for some pieces I chose to keep for myself, has been dismantled. 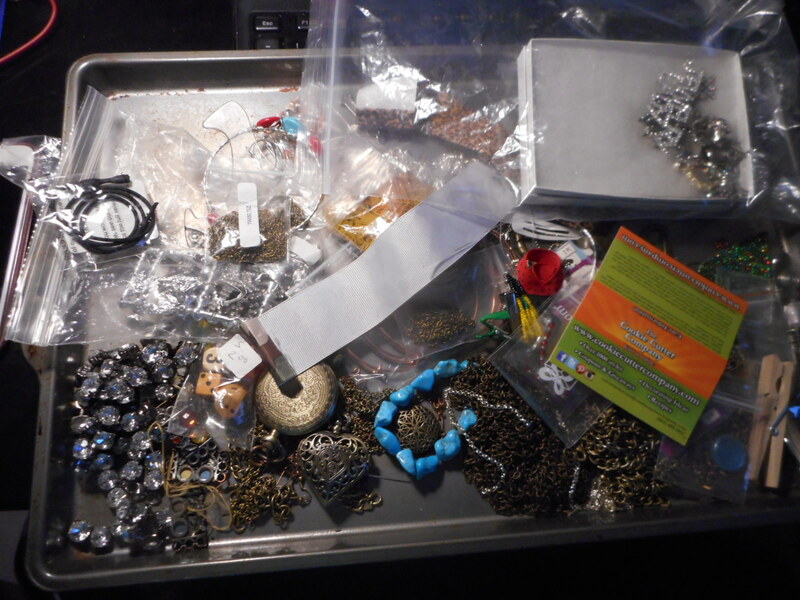 It took me a couple of days to take apart all the jewelry I had made and then slowly file the beads away in my boxes . I think this last count I was at 113 plus a spare one I have not used yet. , well I just used that one, it is the next day and I am editing before I post, but the picture does not show that final box , 22 are seed beads along with a few smaller ones. 64 are regular beads, glass, stone, metal and wood. Some other things mixed in like aryclic and clay. 9 boxes hold charms. 3 hold pendants, connectors and the last one is just stuff for my steam punk jewelry. The weird stuff. 15 are all findings of some kind. Chain, earring findings, ear wires of all metals, bead caps, and so on. 25 years of stuff. I have to make up probably ten more of seed bead boxes with all the bags of seed beads I have collected this past year. So, that is going to happen over the next couple of weeks as I get the other stuff all packed up, I will then start to organize the seed beads and sequins better. I actually have an order of stone beads coming in, my last for a while. I am just plain hooked on that Golden Age beads. The 10 mm stones, especially the mountain jade and candy jade are just stunning. I plan to make myself all kinds of pretties in time. I am starting to consider keeping the seed bead bags in bags instead of the boxes. 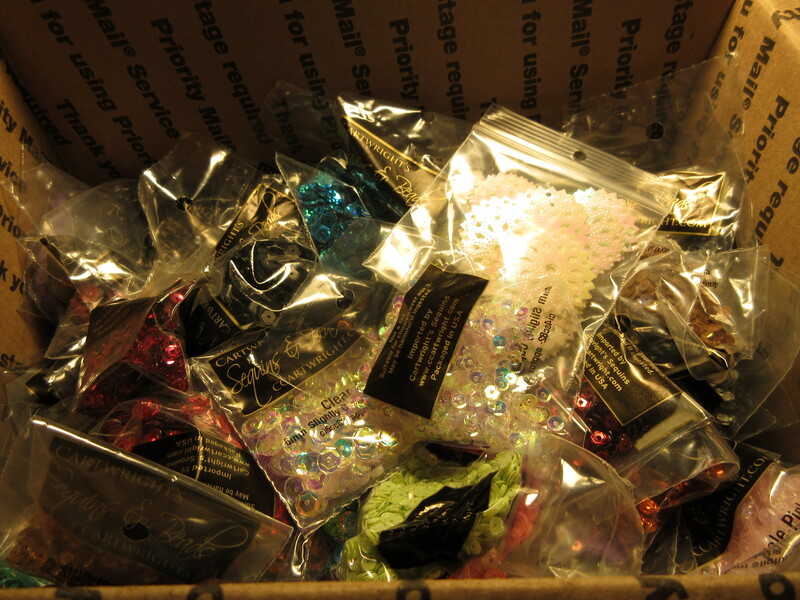 Much easier to pull out and use, and I keep all my sequins in baggies in gallon bags according to color. I did the same with my new seed beads today . I just put the open bag in a small bead bag so I know the color once I open it . The way I see it, I have room on shelf two for about three more rows of eight each, which is 24 boxes, and that is my lifetime limit, lol !! I cannot go past that second shelf, if I have to climb on a step ladder to reach a box of beads, that is definitely too many !! I have so many now that I took apart all the old stuff. It has been fun going through each and every box and seeing what I have. I have looked at virtually every bead I own this past couple of days. Along with my charms and findings. I still have a pretty full tray to go through, my job for tomorrow. it is a nightmare !!! 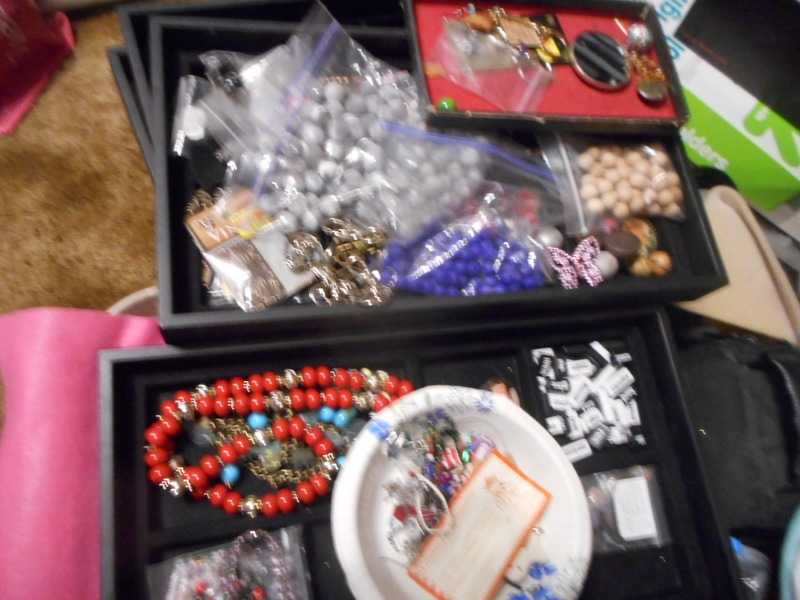 I have three trays total and two small jewelry trays also. So, five trays to put away the next couple of days. I cannot believe I am showing you this, not my finest hour, yikes !!! So, I probably will need a few more boxes for the regular stuff as well. I only have one spare, so I will have to pick up a few more next time I am at the store. I will try to get as much as I can into the existing boxes plus the one new empty one. 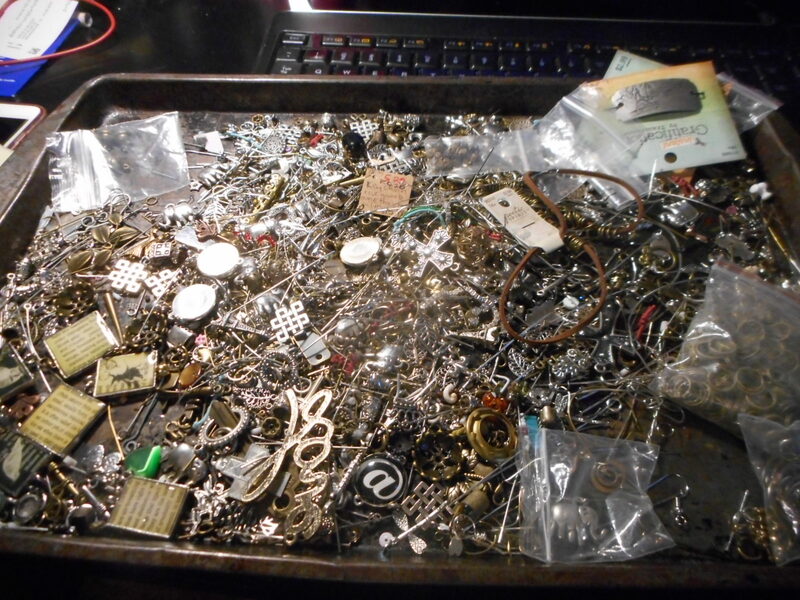 I still have a few pieces of old jewelry I bought to take apart and a few things on trays to put in my project box as well. But I have a pretty good amount of work left, even though I have been working for three days now. It is a lot of work, but very satisfying to see it getting done. I like the idea of touching almost everything I own and seeing what I have. I will still bead for myself, gifts, the occasional custom order and so on. I just will not be making up any stuff to put on sale with these beads. I am not sure yet about the seed beads and sequins. Here are my new sequins, got a box today from Cartwrights. I have mainly been buying the 5 and 6 mm for 25 years, with only a few smaller ones. I decided to stock up on smaller sequins as it would give me more variety and versatility when I am creating with the sequins and seed beads. I bought a few interesting new items as well. Since I started this yesterday I am down another big tray of findings. I got a lot of it put away today !! I still have a lot of bits and pieces, stuff I could just toss but I will not. It is a hastle putting away a bead here and there, but I will just do it. I do not like the idea of throwing stuff out to be lazy so I will get it all put away. That is most i nteresting thing about this project. No matter how hard I try, I find one more bead to put in a box that I just did. I will find one red bead, and then a blue bead and a green bead and when I am done, I have to get all the boxes down again for the individual beads I found. But once it is done, it is done. 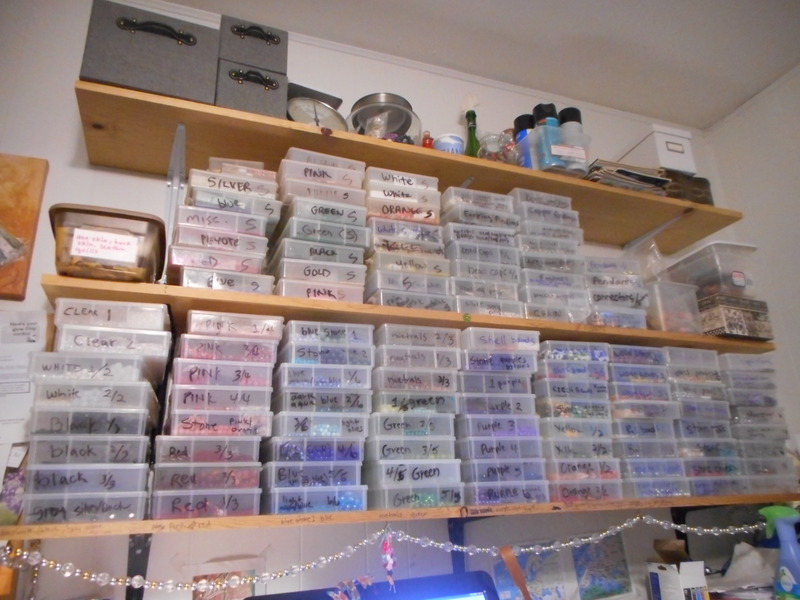 I figured I need not only the boxes for seed beads, if I go that route, I may use the bags, but I need another six or eight to properly organize the other boxes. I have a lot of stuff with two beads in one compartment, which is fine when it is a few of each, but when I have a half cubbie of each color, I do not like that. So, I will probably add one more container per color, for the regular beads. I figure about ten with each color and some of the specialty ones and I do stone in seperate boxes so I need a stone per color on a good amount of them also. I am hoping by mid July I can get it all done. I find it hard to get the boxes , I often can only find a few at a time. I need between ten and twenty. So, it has been a lot of work, but also a lot of fun going through it all and seeing what I have in my collection. 1 birthstone beads for a particular necklace I make, with the other parts for the necklaces included. then I have seed beads , I use 11/0 size , many of which are 25 years old. 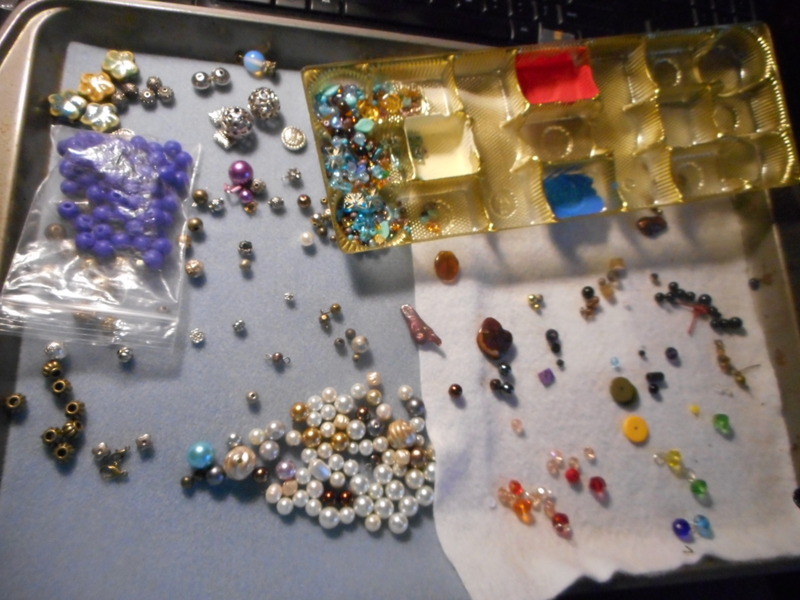 I am now collecting TOHO which are better quality for bead work , but the old ones still work for many projects I do. Only one white box on this list is TOHO, the rest are what I bought all those years ago !! Mostly at a store that specialized in American Indian bead work supplies and books. I have some of the books too. We had to drive pretty far to go there, so I would save up and get as much as I could at a time, they came in hanks and big long tubes. I even bought quills which I have yet to use !! 25 years old !! Those I got from Tandy . I did buy a quill jewelry making book at the store, but never got around to using them. I also have three smaller plastic containers with gold in one, some pinks in another and a project half done in another. I have 4 silver charms, a copper charm and 2 antique brass charms and then two with pendants and one with connector type pendants. 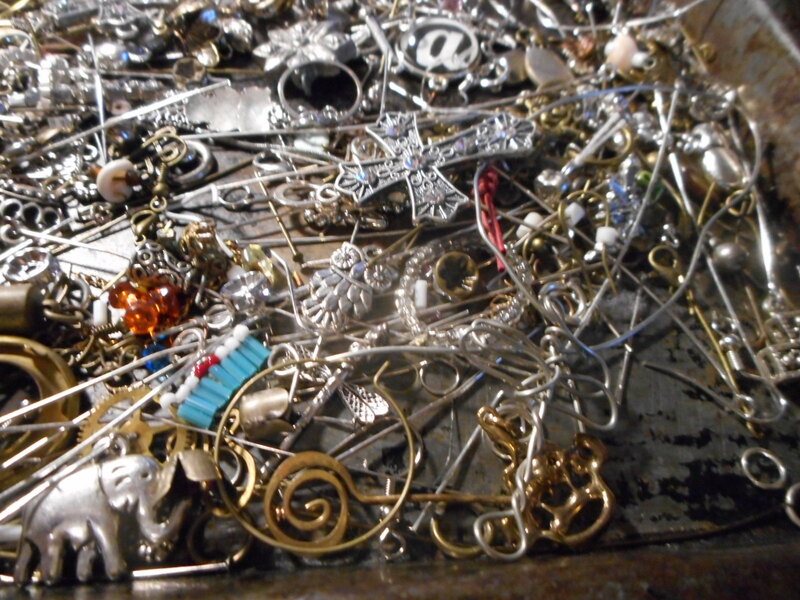 I have one box of charms that are just crosses and angels and a few silver prayer boxes I had put on my charm bracelets. It is a LOT of inventory. Now just for hobby, not business. Which I am fine with and so is my wonderful and supportive hubby !! I have no clue how many boxes the sequins would fill, I have a gallon bag per color and they are stuffed full in most cases. So, I have put my self on a no spend budget for beading for the next few months at the very least, I am thinking for the rest of the year , and needs to be next year too, ha ha, except for the boxes. Those I need. But I just got in my last big orders of sequins, seed beads and stone beads and now I am DONE. This girl has more beads than she can use any time soon. I plan to have fun making really nice t hings for myself and for gifts and I will always be open for a custom order as well. No more listings on Etsy, no more inventory in stores. I will share here and that is about it !! I want it to be fun again, it had stopped being fun a long time ago !! Now I can enjoy creating again, well, once I finish shoveling out the studio. ← Seed beads and sequins, sequins and seed beads !! Hey Stephie! I’ve got a question for you. At Christmas I created a custom owl dreamcatcher for a parent at work. She came in this morning and told me that she was ready to purchase another one, and she had quite a few co-workers that were interested as well. The dreamcatcher that I created for her was not up to MY standards (she loved it!) so I figured I would change up a few things. I want to use a suede lace/cord, but when I was looking online, I discovered a faux suede cord. Have you ever worked with either of these in your jewelry making, and if so, how would you compare the two? You were the first person that came to mind. I hope that your renovations are going well and that you are enjoying your summer. Thank you girl! I appreciate your insight. I am so sorry I took so long to answer, I did not get online until later in the day ! To be honest, I have never really worked with either of those cords/laces. I could not honestly tell you an opinion, I am so sorry !! Hi Seyi, what a nice surprise to hear from you !! Thank you so much for the kind words, they mean a lot to me !! I am making an announcement on the blog today , on to new big things !! !